Many foreign tourists who complained to the conditions they experience the first time in Bali. Many bad things they experienced while in Bali. Disappointment, resentment, sadness, anger, and even grief is often experienced by foreign tourists while in Bali. There are a lot of bad things about Bali that should be known by those who wish to visit Bali. One bad thing about Bali is dishonest behavior is the moneychangers. Bali is a tourist destination by tourists from various countries. Money is the vital thing to bring tourists while traveling. Although Bali is a cheap tourist destination in the world, but bring money is a necessity. Without money, anyone who vacation will not be able to survive well. There are many moneychangers in Bali, especially in tourist destinations. In Kuta, moneychangers are easy to find. Small stall in the street, in the supermarket, there are many moneychangers. Starting from the formal to the informal. Which is owned by an individual, to which are owned by businessmen and banks. All changers aims to earn money from tourists and earn huge profits. Most of the moneychangers in Bali cheat. They lied to the tourists who first came to Bali. The tourists will be lied related exchange rate prevailing in Indonesia. The difference of the amount that should be given to exchange money also was incompatible with the currency exchange rate that has been there. Moneychangers take huge advantage of the tourists to determine their own exchange rate. In contrast to the amount set by the central bank and not appropriate as the result of currency trading and exchange rate on that day. 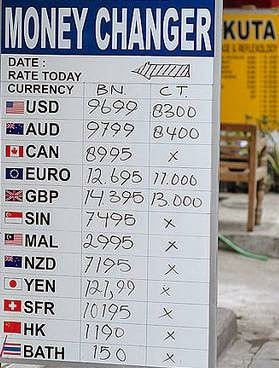 If the local currency exchange rate strengthened, many excuses made to trick tourists changing money. It is true that this is a business. But if the business is not healthy, then that harmed consumers. The government must take decisive action to the moneychangers who do not care about customer satisfaction and comfort, especially the tourists who become their target market. If the dissatisfaction of foreign tourists to the moneychangers in Bali continues. Then most likely the tourism industry in Bali will be destroyed and sunk. Because Bali has bad things that can make foreign tourists feel uncomfortable and disappointed.